Remodelers often use drywall compound, not only to secure and conceal joints between wall panels, but also to add visual interest. On ceilings, in particular, applying drywall compound can be, not only a decorative decision, but a strategic one as well. Read on for the DIY details. Adding a little texture to drywall compound can go a long way toward hiding imperfections in ceilings. And it’s an easy process. Here’s how to do it. Pour a box of drywall compound into a 5-gallon bucket, then enough add water to achieve the recommended water-to-compound ratio. Blend the ingredients using an electric drill outfitted with a paddle mixer. 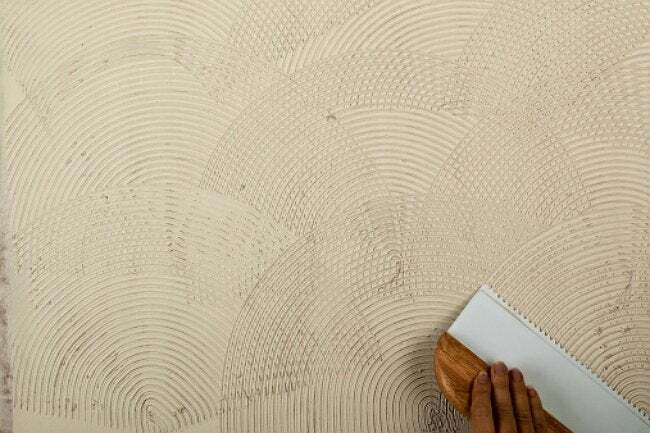 The ideal consistency is lump-free and just a bit thicker than paint. Next, dip a long-handled paint roller into the bucket, coating the nap with the mixture. Remove the excess by tapping the roller on the side of the bucket. Now, working in one small sections at a time, roll the mixture onto the ceiling. After that, drag a clean broom, a comb, or a different texturing tool across the surface of the ceiling to create the texture you want. If you don’t like the results the first time, simply re-roll the area and have another go. Be sure you’re satisfied with the look in one area before proceeding to another. Don’t dawdle, though, as the mixture can be expected to dry pretty quickly.